Even before I was contacted by Plum Organics about creating a gourmet recipe for their Little Foodies Cookbox, I frequently purchased their baby foods as snacks for the boys. Because while you might consider them baby food, they actually have so much more flavor than other purees, and I love how portable they are for snacks. Plus, I feel good knowing that they are wholesome and free from all the yucky stuff - indeed, the only ingredient in the Just Peaches is just that...organic peaches! The boys love all the different flavors, and are thrilled when I pull them out. I think Reid may hold the world record for fastest guzzling of a Plum fruit pouch. While I had never considered using their products in the creation of dinner, I realized it was a brilliant idea! 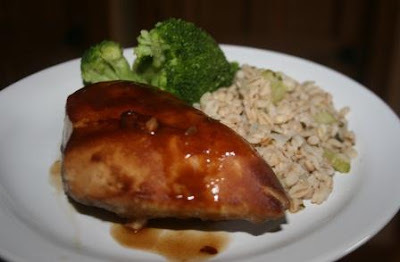 The recipe I created is for Glazed Peach Chicken. Bursting with flavor, you'll notice just a hint of the succulent peaches. It doesn't even take many ingredients to toss this together. 1. Combine soy sauce, sherry, and sugar in a small saucepan. Heat until sugar has dissolved. 2. Remove from heat and stir in garlic and Just Peaches pouches. 3. Divide sauce in two. Place chicken in an airtight container and pour half the sauce over chicken. Place remaining sauce in separate airtight container. 4. Allow chicken to marinate in the fridge for 2 hours. 5. Preheat oven to 325*. Place chicken in baking dish and discard marinade. Pour fresh reserved sauce over chicken. 6. Bake uncovered for one hour. You could half the marinade recipe and reuse it, but I've always thought that a little icky, which is why I made a double batch so you can use fresh. I'm sure, as well, that you could skip the fridge marinating part if you were in a pinch time-wise, and still end up with a delicious dinner. I served ours with a barley/celery/onion and herbs medley, plus some steamed broccoli. You can also check out the recipe on the Plum Organics Little Foodies Cookbox here. Plum Organics is generously giving away a prize pack to one reader. This prize pack is so cool that I had to hide it in a closet, for fear my boys would get a hold of it! Stuffed with an assortment of baby food, toddler food, snacks, buttons, stickers and even coupons, this would be a great one to win! This is a Rafflecopter giveaway, so just click on the "Read More" under my signature to enter. Disclaimer: Plum provided me with a 6 pack of the peach flavored baby food to create a recipe. I was also provided with a prize pack to give away on my blog. In addition, I was compensated for the development of the recipe. This did not influence how I feel about their product, and the opinions above are my own. I love your recipe! JDaniel would inhale the contents on the box too. With soy sauce and sherry as ingredients, I'll definitely try this recipe. That recipe sounds so great. I will definitely have to buy the plum organics peaches and give this a try. Love the packaging for all their products! We love Plum Organics here. I think that the yogurt mish mash purple roots and fruit looks really great! Not sure if my first comment went thru...Grady loves these fruit packets...any flavor! I don't think ive bought this brand before, but I love these type fruit packets for picky eater grady. Sometimes its the only way to get fruits or veggies into him. His fav is applesauce, but he is willing to try others....like peaches! I've been eating alot of chicken and this looks great! Clever use of the peaches plum juice and the recipe sounds delicious! What a great idea! Who would've thought to use "baby food" as a pureed ingredient in a recipe! I wonder if if they'd work in making a smoothie-like dessert (like the pear one with some fresh blueberries or something) for during the summertime. That chicken looks delicious! I'll have to try it out! YUM!!! I'll try this too! I'd love to try: Teensy Fruits! Your recipe does sound YUMMY! I could never create a recipe like this just out of my head, you are a natural cook!!! You should enter Top Chef! Definitely want to try those peaches. My kids LOVE other flavors of puree pouches. The mixed berry looks yummy- I love what you did with your recipe too! I'd love to try the apple raisin and quinoa blend for Lily! I would try all of them because my boyfriend's daughter LOVES these. we'd like to try the yogurt mish mash or the fiddlesticks. My little one would LOVE the yogurt mish mosh! The second blends look good, especially spinach, peas & pear! I'd like to try the super puffs. I like the spinach, peas, and pear. 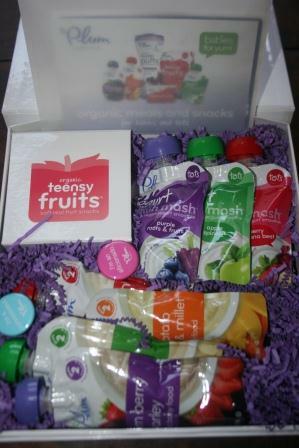 The Teensy Fruits look fun - I bet my toddler would love them! Teensy Fruits I think this would be great for the picky eater in my home. The Teensy Fruits in berry and the fiddlesticks. Thanks for the great review! I think that my toddler would LOVE, LOVE, LOVE these! In the past, my daughter hasn't liked fruit packets, but she might now that she's older so I'd love to try them! I would love to try the Purple Fruits and Roots Yogurt Mish Mash. Looks yummy! kristiedonelson(at)gmail(dot)com Thank you. Wed love to try the fiddlesticks! Spinach and Apple Super Puffs sound great. I would like to try the yogurt mish mash. Yogurt Mish Mash sounds like a good product! I like the sound of purple roots and fruits - especially since we are growing purple carrots in our garden this year! The berry teensy fruit sounds great! We would like to try the Mango/Peach pouches. I feed my little one Plum Organics all the time! She hasn't had one she doesn't like! I LOVE the fact that they are organic!! The twins absolutely love Plum food! The only way I maker sure they eat their veggies. And they love teensy fruits. So hard to find them around here! Good job Lisa!!! Yogurt mish mash- looks great. The broccoli and apple puree! That recipe looks awesome! Thanks for sharing! My son has enjoyed every single flavor I've given him, and I love it too since he's an anti-veggie little guy. I try to get the pouches that have both fruits and veggies. any of them!!! my daughter likes these kind of snacks for sure!!! This looks delish. 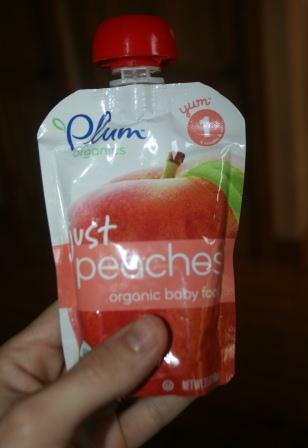 LOVE all of Plum Organics, my 7 month old loves the peaches!